I’ve sadly had yet to get the right day or chance to actually head down to the capital for one of the food truck lunches held there, though hearing about it as a new regular and popular hotspot for it starting last year (if I’m correct it used to be timed for a few rallies/events, and now just any ol’ pretty day). Indicative of that, there was yet another truck that I was becoming quite worried in being able to hit, having found difficulty staying in touch with their social media updates and the fact that most of the ones I DID see were at some of the more random and not-so-familiar places (aka, an event or out-of-area business). Thus I can say I was quite thrilled on one of my now very-open mornings/early afternoons before work, which had some beautifully sunny but mild weather, that I saw there were a few trucks out in front of the big white building. So I took the opportunity to go down and hit not just one but TWO new trucks on my radar (the other review should be coming soon), and here we are! I will say that the parking and driving situation near the capital was annoying… but that’s not what these posts are about (doesn’t seem to stop my bitching on other things though does it?). 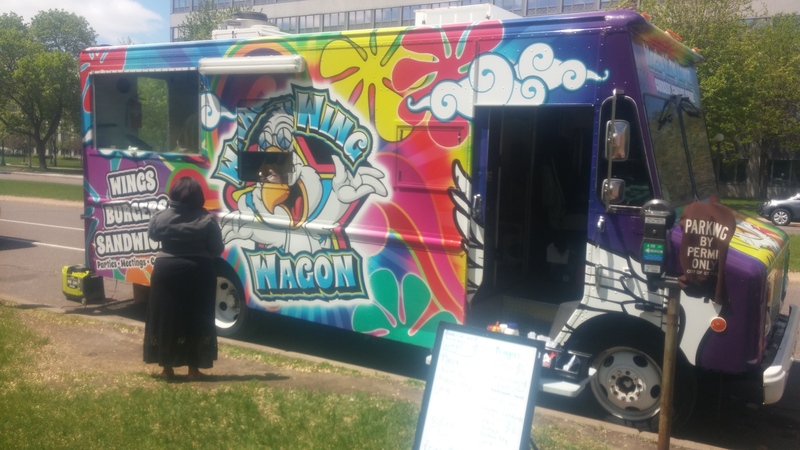 We’re talking food trucks, and today I got to hit one of MY most anticipated new businesses on the street, Wacky Wing Wagon. What else do I need to say that their name already doesn’t? 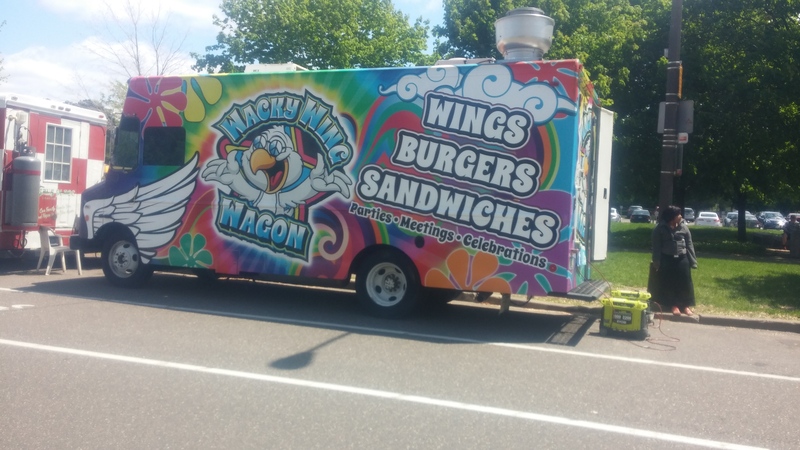 They sell Wings, their design is Wacky, and they’re a Wag… well, okay they’re a Truck, so you can ignore that part, but two out of three is still good right? 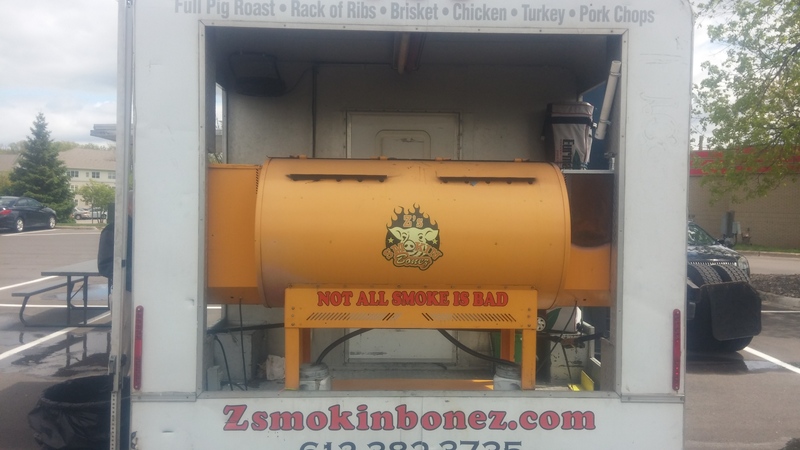 And I like the truck, it’s interesting… and I’m not just talking about the wrap job done on it, with the whole ‘chicken wings instead of flames’ dealy. Not sure how well you can see, but the window set-up and placement is quite unique, very ‘non-standard’ compared to practically every other kind of truck/trailer found on the street, what with the glass-covered display window and the little sliding eye-level hatch in the middle for taking and delivering orders. Which I just HAD to ask them about, it get me curious as to whether this used to be a different kind of truck that was re-fitted for food service, or if it was all custom. Apparently it’s custom, made in Arizona I think he said (or Atlanta), which… apparently requires that all trucks be made with a bullet-proof glass window. So that explains THAT part of it, haha. But back to the food, WWW specializes in, what else, Fried Chicken Wings (or Boneless, which I always loved as a kid with KFC’s Honey-BBQ. Mmmmm empty calories…), which one can get covered in classic Buffalo Hot Sauce, BBQ, or Jerk (Caribbean flavor mon). 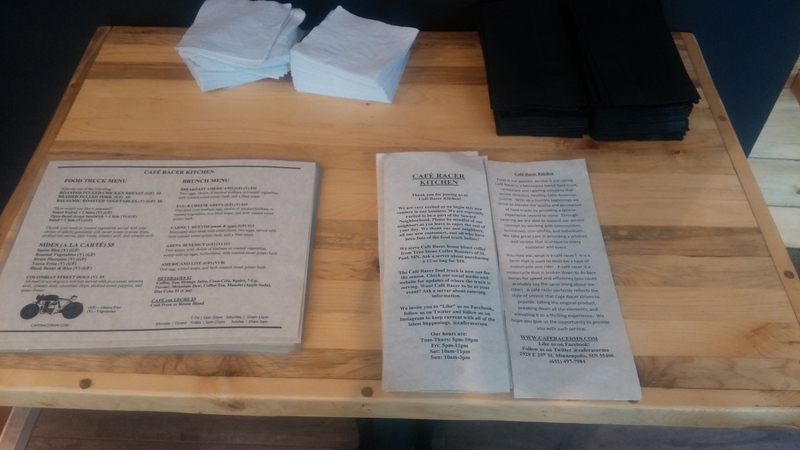 Besides these, one also has the option of a Chicken Sandwich, with the same sauce possibilities for flavoring, or Burger with a variety of toppings/styles (like the Pretzel Bun and Bacon Jam, not sure if it’s seasonal or not). There are of course Fries for side options. 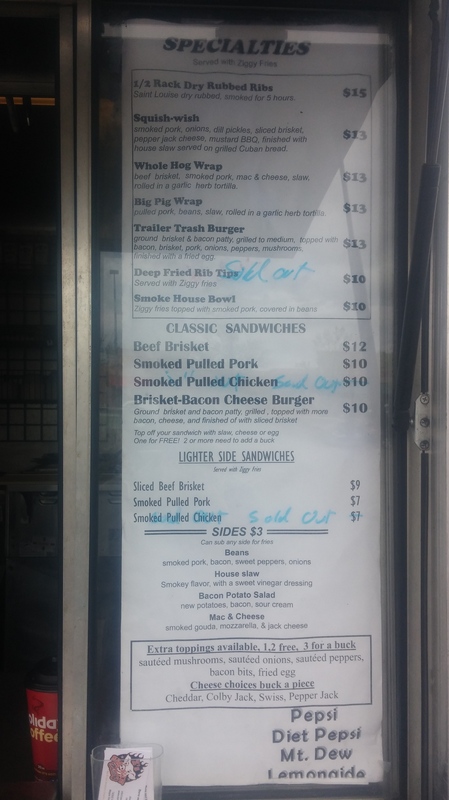 As tempting as it was, I REALLY wanted to try that bacon jam, the burgers were skipped, because gosh darnit this is a chicken truck and we need to go for chicken! I don’t understand why so many of them keep adding a burger options (I know, I know, ‘cuz people buy them, which is their own fault). It did look rather decent though, so for repeat customers to WWW who wanna try a burger, go for it. 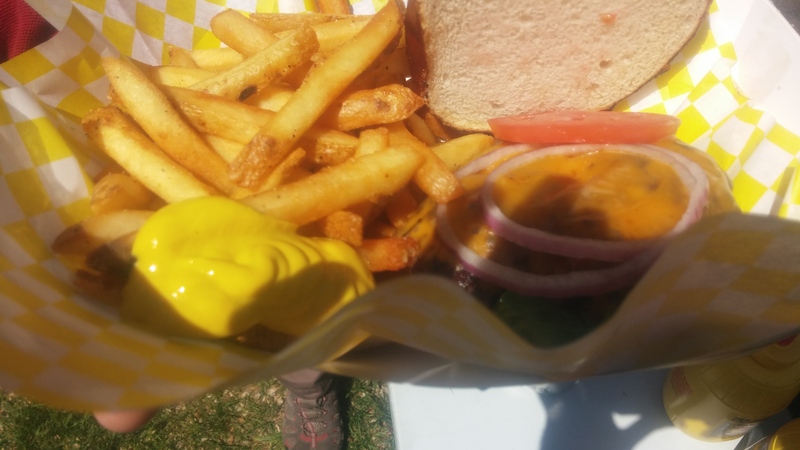 Also, though I didn’t have the chance to try them (if I was only doing one truck that day, I might have), but the fries actually looked very appealing to me. 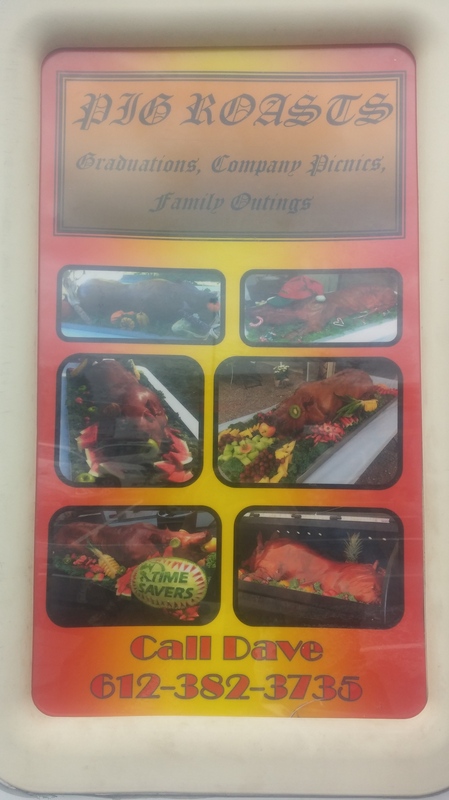 Thicker cut, golden, skins, crispy outside look, those seem to be the nice craveable kind that hits the spot. But let’s talk about what I DID have. Since I was able to get the same sauce options for both, I went ahead and grabbed both a Wing basket (bone-in of course, gotta set the standard) and a Chicken Sanwich. Hot from the friar, the wing skin kept that fried crunch we look for, even when thoroughly doused in the sauce of choice. 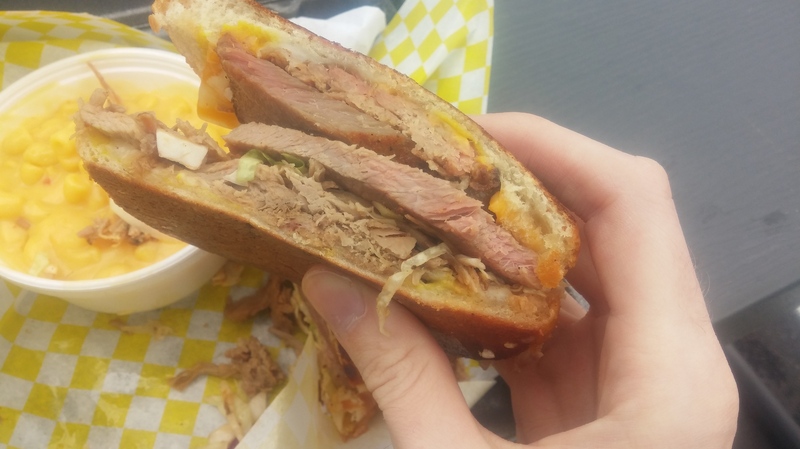 The meat inside was moist and tender, as desired, and what’s best is it wasn’t greasy. Now I can’t really say I’m that great at telling the difference in quality between different fried chickens, either wings or other, so I can’t properly judge. In hindsight, though, I am wondering IF some more seasoning on the wings beforehand would have helped? The sauce could have maybe used some extra (I’ll talk about those in a bit though). Chicken sandwich… grilled delight. 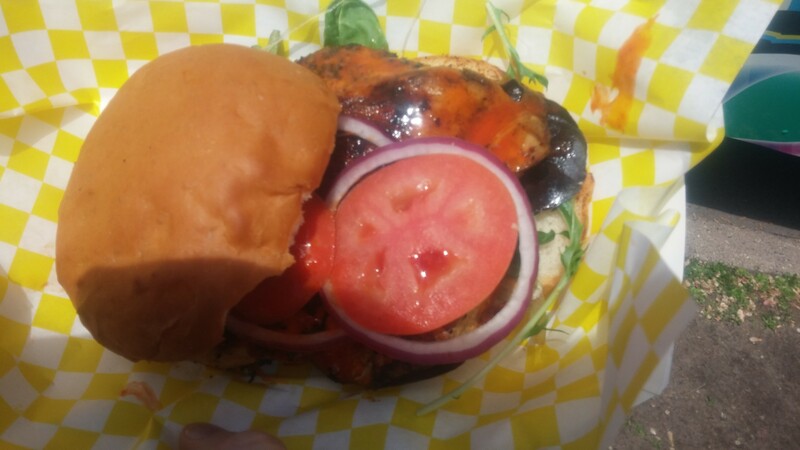 Oh, I still love a good toasted bun, and this one was done nice, with a nice char on the chicken breast (a positive aspect, giving one the option for healthy white meat vs, well, fried skin and some protein), which still contained a juicy and tasty interior. It’s a great option for those who crave the burger flavors but want/need to go a little healthier, with all that nice grill flavor around it. 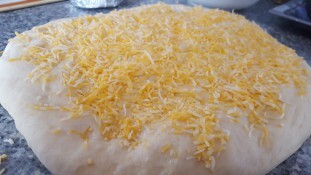 That, the bun, and the sauce contributed the main positive points, as the other generic toppings only added the typical support bases, so don’t look or expect for too much ELSE special about it. As a very simple grilled chicken sandwich, it definitely gets my thumbs up. Finally, the sauces. 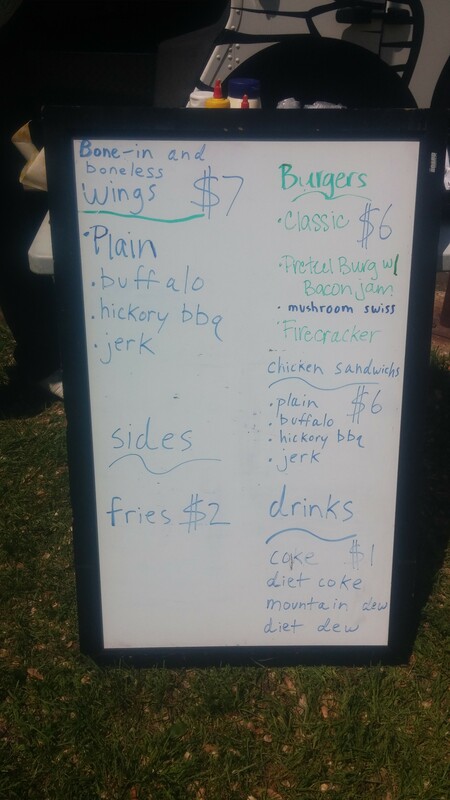 I got to try the BBQ (on the wings) and the Classic Buffalo (sandwich). Both of which were nice, typically decent, and obviously handmade, having more of those natural flavors vs the highly generic/mass-produced go-tos. 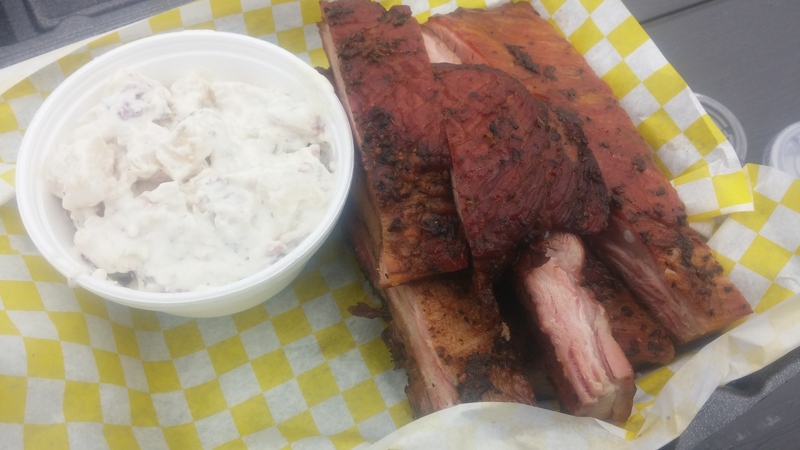 But though the sauce overall meets approval for structure and execution, I find little to truly be excited about, nothing ‘special;’ these are really only just a little better than what one normally would think of for BBQ and hot sauce. Maybe if they had more options I would not mind so much, but if it’s just these two plus Jerk I would hope for something fantastic. Well it’s chicken wings covered in sauce, you can imagine their factor for this! Overall very walkable, but messy (unless one got plain wings, in which case WHAT’S WRONG WITH YOU!!??? ), napkins heavily required. Basket-based, the sandwich was an easy one to eat with a free hand, minus maybe a tomato slice falling out (though that may have been a different sandwich I had that day). 8-piece wing basket, every one, is only $7, and $6 for any of the burgers and chicken sandwich, overall it’s a rather damn good deal. The food is pretty simple to back this up, and fries come in at an obvious $2 extra (about average, I’ve seen places charge more, especially for ‘special’ kinds), and again they seem rather decent for the upcharge. 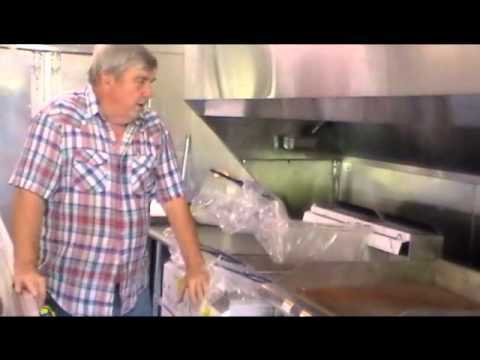 Generally average waiting time for wings to fry and buns/meat to grill on the flattop. 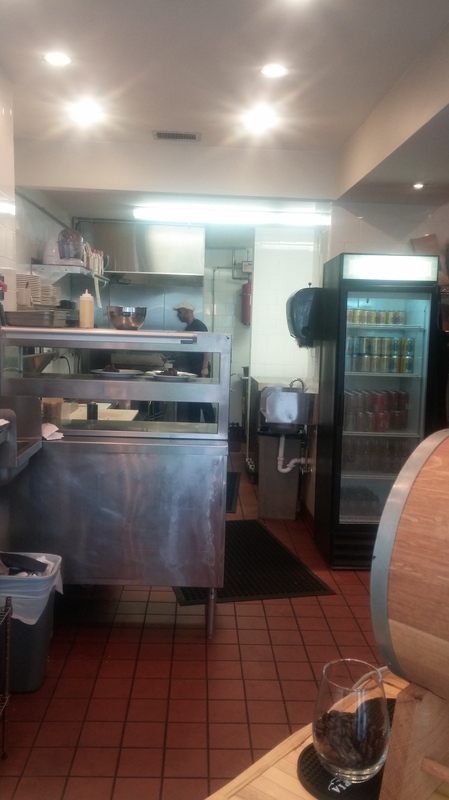 They CURRENTLY only have one friar (or two small ones, can’t remember), which can easily push back wait time once there are multiple orders in the window, having to wait for different batches of wings and fries to finish cooking before another one starts. Wishing them luck on being able to get an extra one soon to help with business! Distinctive, vibrantly themed with a fun name and, I mean come on those graphics! It’s got those great combination of factors which made me quite excited search them out, then of course sadness at not being able to do so for so long. Though I would say that a distinctive drawback to this occurs upon arriving, likely a combination of that super simple white-board menu and the rather… ‘lacking’ menu. I mean ultimately there’s Burgers, Chicken Sandwich, and the Wings, which is usually more than enough except there are only FOUR types of wings, two of which being Hot Sauce and BBQ (the most generic flavors) and a third just Plain. A big part of me was really hoping to revel in the wings more, have a few more interesting sauce options (you have that Bacon Jam for the burger, why not mix that with something to toss the wings in?) to try for that cult-corner EXPERIENCE of going there? Or something like that… just want that menu to excite me more ya know, get my palette dripping, the first stage of presentation before seeing the actual food. But overall still awesome and fun. First off, I feel like I want to openly say that I KNOW, I’m aware, that this added bonus or minus section is mostly situational. A lot of the people handling the window are always great, friendly and fantastic, it’s just some situations and people (or seeing repeat business) that it shines more. 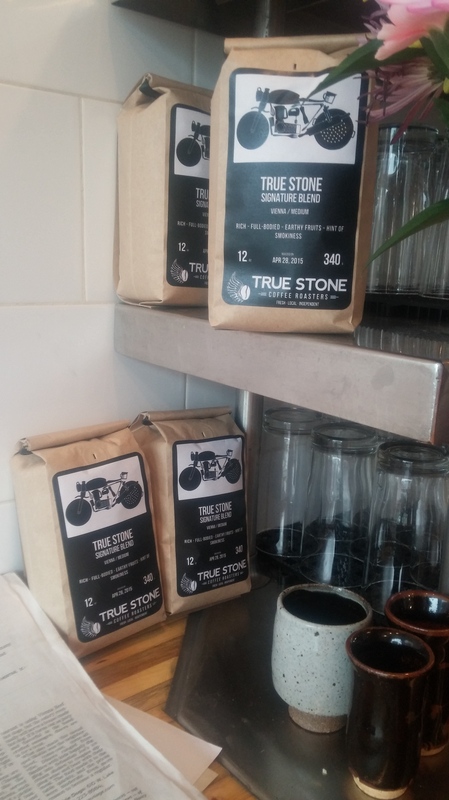 But I started off with having this section as an official way to reward or critique the trucks who, in my visits, I felt deserved it at that time, and I want to keep honoring that part of myself and this blog. Which is why I thought it was quite nice that, during the little service lull as our food was being cooked and there was no one else waiting in line, the owner at the window walked out and started chatting, explaining the friar situation and apologizing for it between discussions of weather, food, etc. Even taking the effort to check my sandwich, which had a suspicious string of something which we then realized was just a super-thin onion, haha. It added nicely to the visit for me. Wings may not be the handiest and cleanest of street food, but if you’re looking for a fun and unique joint to check out then Wacky Wing is the place to go, especially when looking for the lower-priced options. 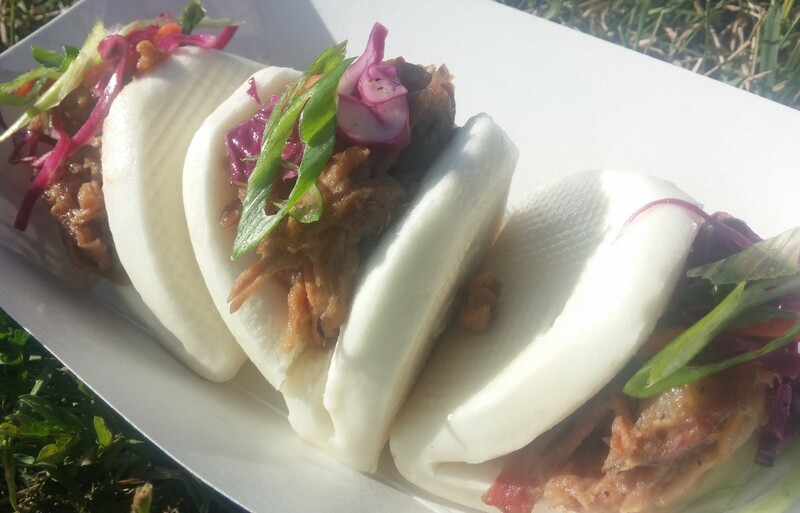 Also great options for food-truck-days/coursed meals as an appetizer visit, or a snack to share with friends between other things. Any first or single visit simply should constitute an excuse to go for the Wings, Bone-in preferably but I will not judge. 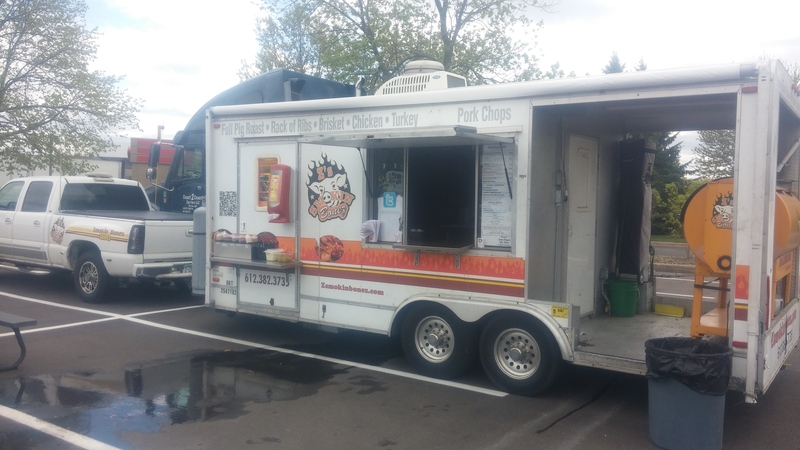 Other items should be saved for repeat visits, though I will say that IF one is in the mood for Fries (as-is or to accompany some other truck item), and there isn’t another fry-specialty business nearby a-la Neato’s, this seems to be a strong contender to get them from. 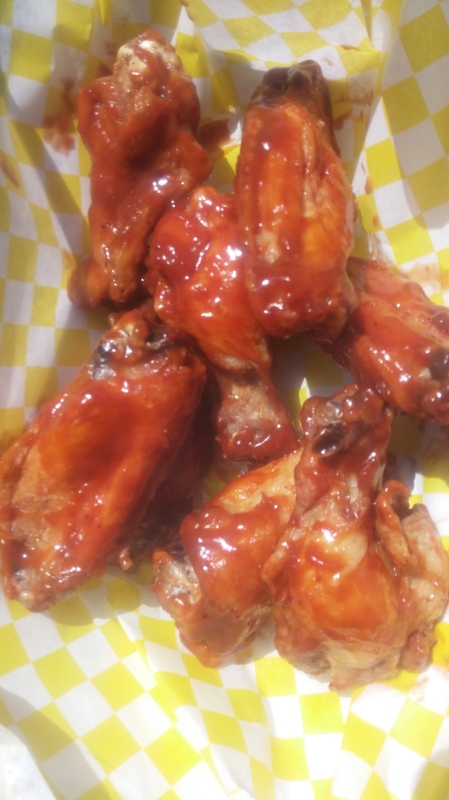 As for the wings themselves, go for Jerk; I may not have tried it but I can feel, after having the other two, that it’d easily be the most exciting sauce of the lot, get that full experience. Having been doing much writing on the side for other food and food truck websites such as Food Truck Empire, a national publication dedicated purely on articles and projects designed to help guide new owners in business and starting up (I definitely suggest anyone getting into the industry to take a look at it), my awareness for many of the truck industry’s aspects, as well as what it means to run a business, has most surely been expanded. It’s been and continues to be a unique experience that challenges me to think about and write about subjects I normally avoid (I seriously had to write something about Taxes… boy was that taxing –bad-um tish-. Though if you wanna take a look at that article, it’s Here), as well as ones I didn’t realize were so big. One of these has been the presence, practically the fleet, of Food Truck and Concession Trailer/Stand/Cart Builders throughout the country. 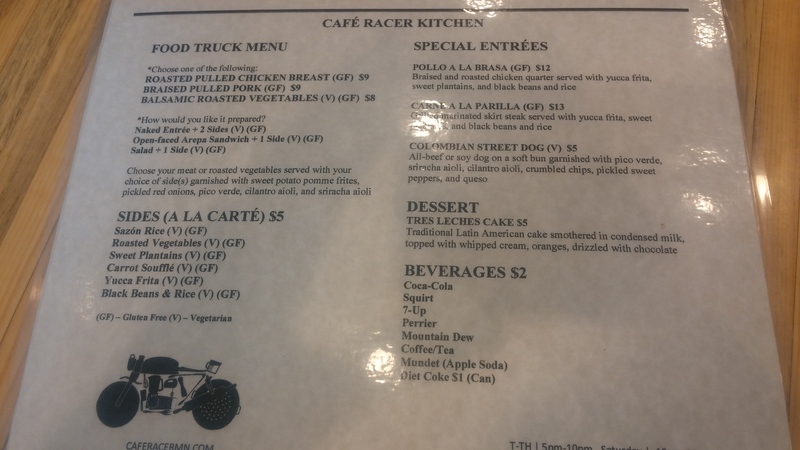 A couple years back I had a conversation with Luis from Café Racer where he mentioned how few of them there were in the country, which was bounced off the fact that he works in a shop that has built Food Trucks, though now I’m guessing that was meant in regards of certain KINDS of shops like his (which I still aren’t sure which one it is, having yet to hear back from that question haha). But in reality there’s tens, dozens, almost if not over a hundred of these builders throughout the country, if you also count vending cart, fair stand, sno cone machine, and other vending crafters and putter-togethers. Some go from scratch, some focus on getting custom and unique interiors while others set their expertise to the truck surrounding it. Those like M&R Trailers, a certified custom builder in Florida, have grown to cater for businesses in multiple states based on the amazing reputations and quality work that they’ve shown and developed. So I thought it’d be fun to look into our own builder for a little after-Memorial Feature, a thank you for providing some of our local mobile business owners an awesome way to get around and present their ideas! 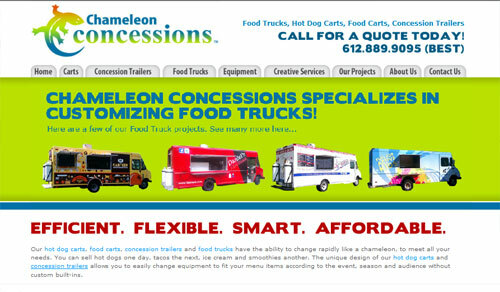 So far (again, besides the potentially different shop Café Racer came from), we only have one, Chameleon Concessions. These are the guys that have designed and created some of the most vibrant, attractive, and cool-looking trucks on our streets: Melch’s Meat Wagon, Hibachi Daruma, A Cupcake Social, the Taste of Target Field (that’s a cool design really, great TV installation and other things), all that stuff. When Andrew Zimmern went for his Food Truck, Chameleon was the builder that took the job, and AZ Canteen was born. So it’s safe to say they do some serious work. Besides that, the guys have also done with work Trailers, Carts (from hot dogs to sno cones to doughnuts), Fair Stands, basically every major manor of vending machine has been tackled at least once. Their Gallery is a fun page to roll through; especially for myself after seeing pages of builders who talk about custom work but basically just make the same kind of truck over and over (so the inside is custom, the actual frame not so much). As for the company itself, it originally evolved from Palm Brothers Restaurant Equipment, which was founded in 1910. 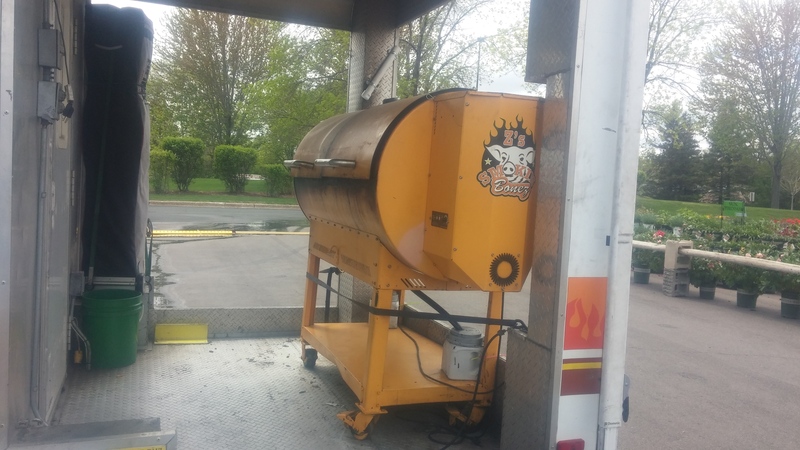 Today they’ve gathered team members with over 27 collective years in the restaurant business, not to mention the cart and vending vehicle operation, to assist and help build one’s ideal Truck or Trailer. Not to mention a whole listing of Certifications to back up their knowledge, so they can come in and help with the design at every step, from conceptualization to equipment to the finished build and wrap job. Safe to say they’ve been doing a rather bang-up job lately, and I’m quite happy that our local trucks have them as a resource (there are some states that still don’t have any you know? So sad). I can’t wait to see what other interesting designs and graphics they come up with for new trucks going forward! 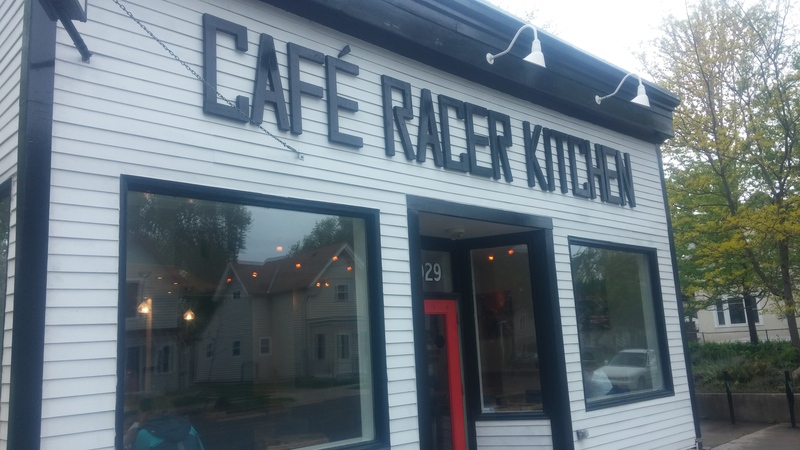 Well I finally got to MY most anticipated Truck restaurant of the year, the Café Racer Kitchen. I would have gone much sooner, but after hearing a month wait for their Beer and Wine license to kick in, figured I’d wait (not that I actually HAD any, but sometimes it’s nice to give restaurants time like that to settle into their groove). 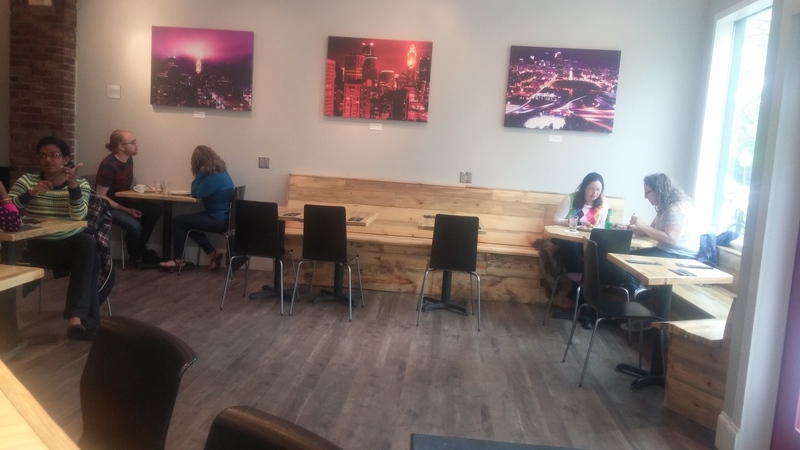 For that, they currently offer a few cans from Indeed and Bauhaus Brewing, along with an Argentine Red and White, though there is talks of some fun cocktails coming soon. 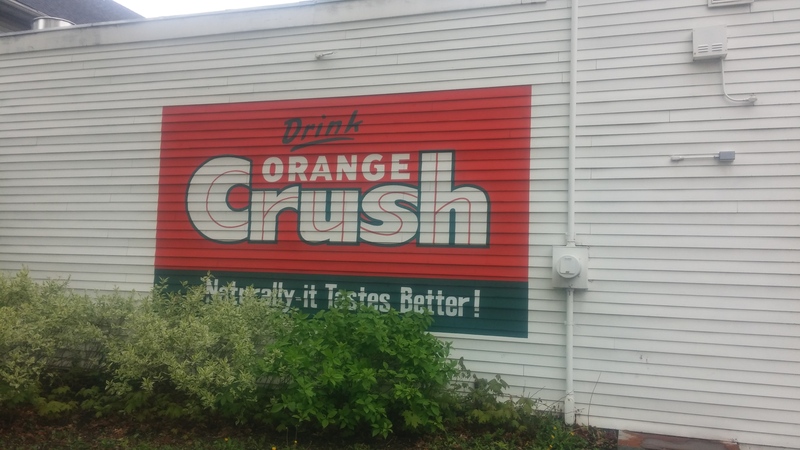 A big painted ad for Orange Crush soda on the building’s side greets one as they travel around the corner; of course I don’t ask why it’s there, whether they did it themselves or were too lazy to take it off in the first place, thus it stays a mystery! 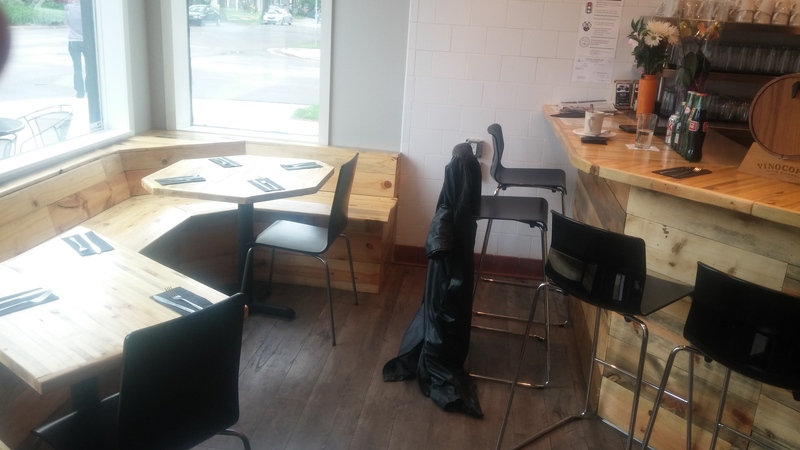 Under the motorcycle-imbued sign and into the door, we find ourselves in a small yet very open environment, smooth and shiny wood booths and tables, mostly connected for an almost communal eating opportunity. But of course I have to sit at the bar, basically four seats in front of the till with a full-on view of the kitchen. Where I get to watch the small team work, the two people in the kitchen and the one working the front (it was a nicely quiet-ish Sunday afternoon, though I bet even in the ‘busy’ periods they may only have 1-2 more employees total) while almost casually yet quickly doling out the truck food. 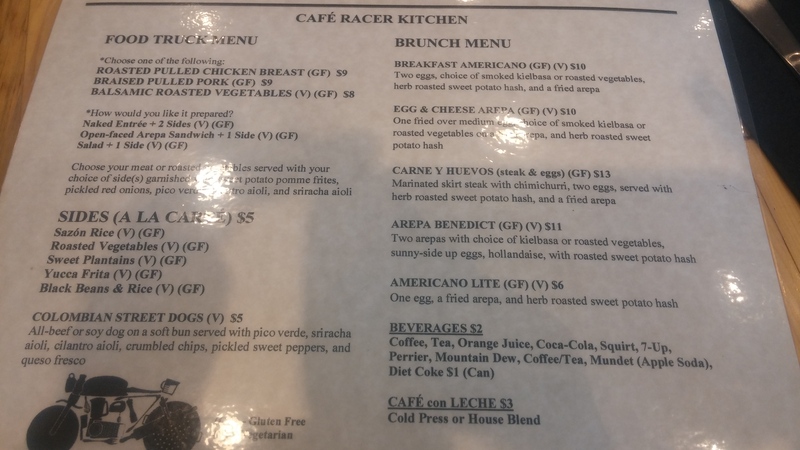 For those of you still unaware of their mobile focus, Café Racer generally sticks with the ‘choose your entrée’ style similar to Brasa, focusing on Central American flavors/tradition. 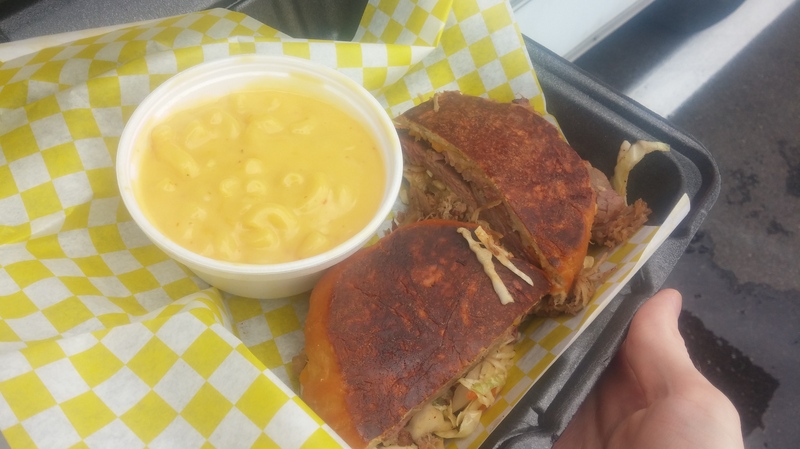 One goes for Pulled Pork or Chicken (or a veggie dish –shudders-), with which they can make an ‘entrée’ by getting two sides (rice, yucca/carrot frites, plantains, beans n rice, etc) or having with a couple Arepas for a sandwich of sorts. They also bring an awesome hot dog with toppings which I’ve experienced Here. All of this has been brought to the menu, alongside a few new plates combining some of these select sides with bigger proteins a la Quarter-Chicken and Chimichurri Skirt Steak. 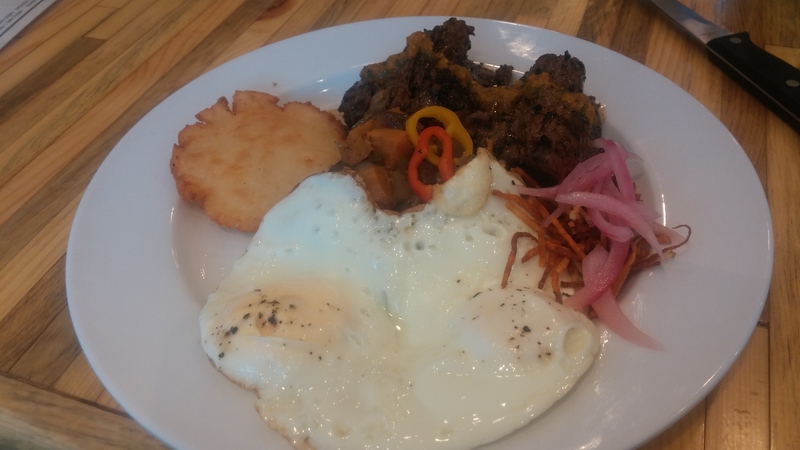 I came during Brunch-Sunday though, so I got to choose between options topped with Egg, Kielbasa for the protein, and plenty of sweet potato hash, arepas tossed in for buns (breakfast sandwich), base (benedict), or just on the side like toast. For a fun, semi-exploratory and semi-just-wanting-new-food visit, the Steak just called out for me. Served with a single small, firm-yet-pillowy masa cake (I love how they do their arepas now, for their style) and a side of eggs made however you want (I went for basted in lue of no poaching, wish I did sunny-side or over easy though, didn’t realize the yolk was gonna get cooked through… cooked well for a fully cooked egg though), they did little to dissuade me from diving right into that steak and hash. The meat was definitely juicy and flavorful, gotta love that harby-garlicky chimichurri paste (really gets the crave and appetite going), it is a bit chewy but only so much as one expects out of a skirt/fajita steak. 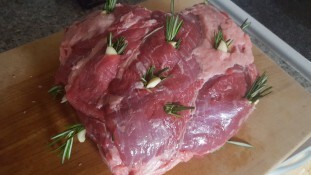 The texture is just as much a part of it as the flavor, I’ve known some chefs who completely get rid of it through very long sous vide techniques, but despite how good and meltingly tender that must be it just doesn’t really fit what this dish is supposed to be in my opinion. Sorry, I just couldn’t help wanting to mention that, I guess that’s what happens with proper food experience; makes you want to discuss other things about it. Can’t help but love a nice hash too, they certainly hit the craving. Roasted together with herbs, this mix or regular and sweet potatoes immediately had me noticing the divergent nature between the two tubers. Whereas the sweet potatoes were fully soft, I found the russets I had to still be sorta firm; I think still cooked, but just on that edge where it could have been undercooked with just a minute less time. At first I was worried about having to critique, but I actually enjoyed it; it gave another texture, again was in an acceptable cooking range, AND it brought proper variation to the hash. What’s the use of using two different potatoes if they both feel the same anyways? Ultimately, I very much enjoyed eating this plate, especially when I got to chop everything up and mix it together, a proper hash brunch! 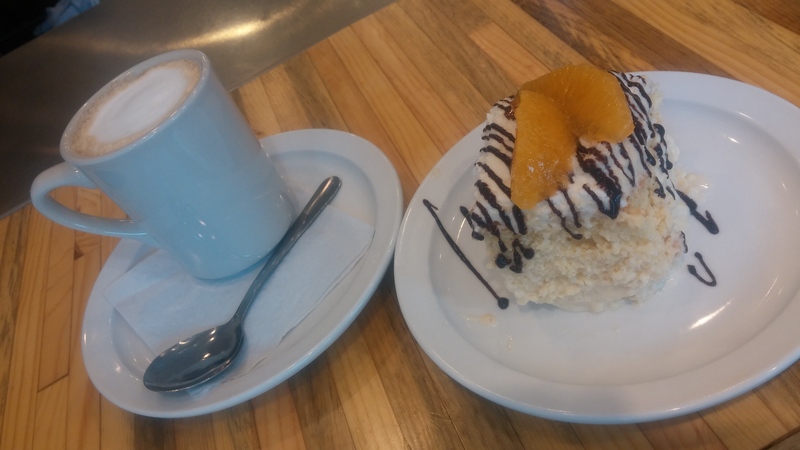 Which is never complete without a bit of coffee and dessert (really brunch is a complete daily meal: breakfast, savory lunch/dinner foods, and sweets at the end, maybe with a bit of booze). The dessert is a housemade Tres Leches (white cake soaked in a mixture of cream, condensed milk, and some other dairy), this one made with a rather compact and dense texture for the thick monster, stuffed with that sweet cream oozing from the sides like a sauce. Luis then tops his with a layer of whipped cream (a classic ‘frosting’ next to meringue) along with some orange segments and a dark chocolate drizzle. 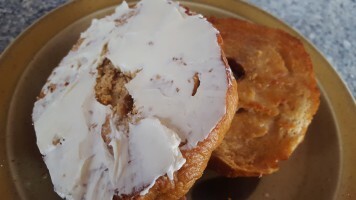 A decent offering, served cold and creamy, made even better when consumed alongside the hot, bitter and slightly-creamy coffee, brewed from a blend made just for them and served as-is or ‘au Lait’ with some simple steamy milk foam on top. It’s a shame that I don’t drink coffee more, this is one of those situations where I really wish I could delve into and pick out flavors like I can with wine and spirits. But I can certainly tell this coffee blend has a personality to its own, that’s quite clear as day, which I’m sure any coffee aficionados can enjoy (whether some of these notes are positive or full-on-catastrophe I can’t say there; for instance, I particularly noted a certain bitter note that I couldn’t tell if it was from over-roasting or natural ‘green’ coffee bean tannins). 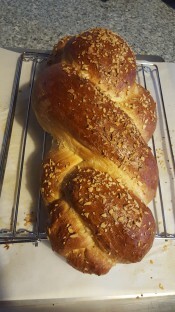 Do what I did and go Café au Lait option, it’s delicious and one can still get the full flavor of the roast; definitely makes the dessert complete. Apparently, despite the month wait, it seems I was STILL a bit soon in coming; word from Luis’ own mouth states that they’re about to start playing around with some further menu changes/addition, including a bevy of small-plate options (sorta like tapas) and some further inventive desserts, such as a Dulce de Leche (a milk-focused pudding-like dish) that’s going to be treated like flan and eaten with papaya. 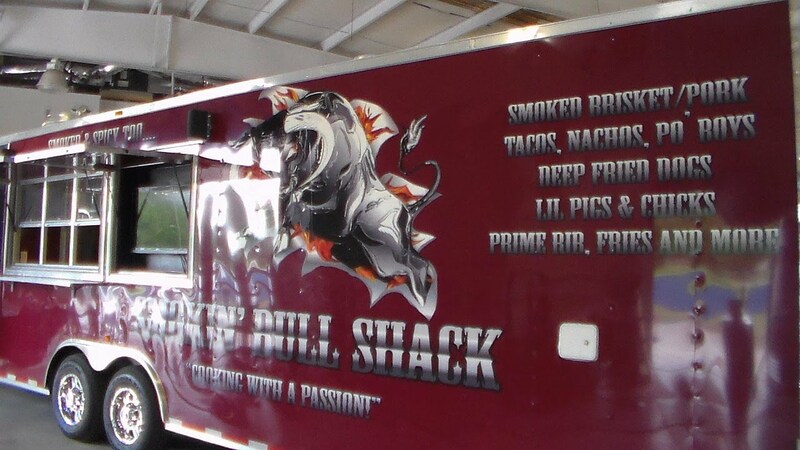 I guess I’ll just have to stop by again sometime soon, which as you know is something I RARELY do for Food Trucks on their own (for efficiency purposes), let alone the restaurants that come from them. 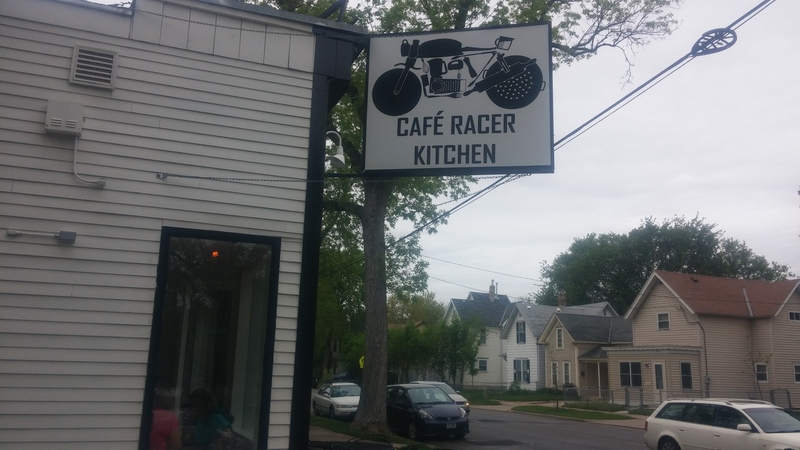 But I think Racer is the first truck-staurant that I have a sincere urge to want to intently go back to for further explorations (I still have more sides to try! ), so do take the hint dear readers and help me help them keep this little café of coolio in business.